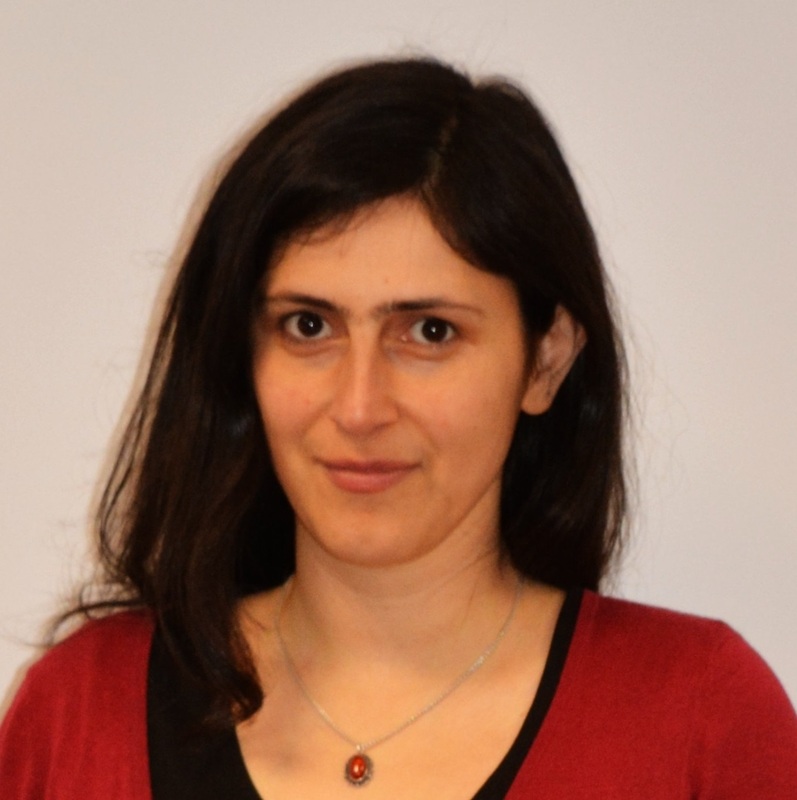 Dr Eirini Sanoudaki ‘s research examines language in monolingual and bilingual speakers, focussing on children with developmental disorders such as Down syndrome and autism. She collaborates with external partners, such as the Down’s Syndrome Association, schools and centres for children with special needs, on projects studying language and cognitive skills in typical and atypical development. She is Senior Fellow of the Higher Education Academy, Lead of Postgraduate Research in the School of Languages, Literatures and Linguistics, and has been Leader of the Bilingualism Pathway for the ESRC/Wales DTP. Athanasia Papastergiou. Language and cognitive abilities in bilingual children.ESRC funded PhD in Bilingualism. Wesam Almehmadi. Pragmatic features in adolescents with Autism. Maram Alamri. The acquisition of spatial relations by Arabic learners of English. I teach advanced modules on language development and disorders, bilingualism, research methods as well as introductory syntax. I have taught modules across many other areas of linguistics. Sanoudaki, E 2015, Επίσημα συμφωνικά συμπλέγματα στην ελληνική παιδική γλώσσα: δεδομένα μιας δοκιμασίας επανάληψης ψευδολέξεων. in G Kotzoglou, K Nikolou, E Karantzola, K Frantzi, I Galantomos, M Georgalidou, V Kourti-Kazoullis, C Papadopoulou & E Vlachou (eds), Selected papers of the 11th International Conference on Greek Linguistics. pp. 1520-1534. Pronoun Comprehension in Individuals With Down Syndrome: Deviance or Delay? Sanoudaki, E & Thierry, GL 2014, Bigrammatism: when the bilingual mind juggles with two grammars. in EM Thomas & I Mennen (eds), Advances in the Study of Bilingualism. 2014 edn, Multilingual Matters, pp. 214-230. Sanoudaki, E & Varlokosta, S 2013, The acquisition of Binding by Greek-speaking children with Down syndrome. in S Stavrakaki, M Lalioti & P Konstantinopoulou (eds), Advances in Language Acquisition. Cambridge Scholars Publishing, Newcastle-upon-Tyne, pp. 435-443. Sanoudaki, E & Varlokosta, S 2013, Αναφορική δέσμευση στα ελληνικά: η σημασία της επιλογής δοκιμασίας. in Z Gavriilidou, A Efthymiou, E Thomadaki & P Kambakis-Vougiouklis (eds), Selected papers of the 10th ICGL [International Conference of Greek Linguistics]. Democritus University of Thrace, Komotini, pp. 1100-1109. Thierry, G & Sanoudaki, E 2012, 'Activation syntaxique non-sélective à la langue chez le bilingue précoce', Revue Française de Linguistique Appliquée, vol. 17, no. 2, pp. 33-48. Sanoudaki, E 2009, Strength relations and first language acquisition. in K Nasukawa & P Backley (eds), Strength relations in phonology. Mouton de Gruyter, pp. 149-182. Sanoudaki, E 2008, Word initial consonant clusters in child language. in T Marinis, A Papangeli & V Stojanovik (eds), Proceedings of the Child Language Seminar 2007: 30th Anniversary. pp. 120-130. Sanoudaki, E 2008, Word initial heterosyllabicity in acquisition. in A Gavarró & MJ Freitas (eds), Language Acquisition and Development. Cambridge Scholars Publishing, Cambridge, pp. 381-385. Sanoudaki, E 2004, Αλληλεπίδραση κατά τη δίγλωσση κατάκτηση μητρικής γλώσσας: η περίπτωση των αντωνυμικών συστημάτων αγγλικής-ελληνικής. in Proceedings of the 6th international conference of Greek linguistics. University of Crete, Rethymnon. Ward, R. & Sanoudaki, E. Bilingualism and Down syndrome: Evaluating the developmental trajectory of language and phonological awareness. Invited presentation at the Down Syndrome Medical Interest Group symposium, London. Keynote at the GALA 12 (Generative Approaches to Language Acquisition) conference. Invited talk at the Linguistic Seminar Series, University of Kent. 2018 ESRC/Wales DTP small grant: Collaboration (CoI and PhD Supervisor). 2017 ESRC Impact Acceleration Account Major Award: PhD Student Community Outreach Fellowship. (PI and Project Lead). PI Gil Greengross (Aberystwyth), CoI Manon Jones (School of Psychology, Bangor). Project: ‘The acquisition of pronominal reference in Greek-speaking children with Down syndrome’. Ward, Rebecca, & Sanoudaki, Eirini. (2019) Phonological Awareness in Bilinguals with Down Syndrome, talk at the 2nd International Conference on Bilingualism, University of Malta, Malta 25 – 27 March 2019. Papastergiou, A., Sanoudaki, E., and Collins, B. (2019) Does minimal exposure to Welsh influence executive functions? Evidence from Welsh-English children talk at the 2nd International Conference on Bilingualism, University of Malta, Malta 25 – 27 March 2019. Almehmadi, W, T. Tenbrink and E. Sanoudaki, (2018) Pragmatic and Conversational Features of Arabic-Speaking Adolescents with Autism Spectrum Disorder (ASD), poster at the Autism Annual Research Conference, 6 September 2018, City University, London. Papastergiou, A., Sanoudaki, E., Chondrogianni, V., (2017) A study on the executive functioning of Greek-English bilingual children, oral presentation at the International Symposium on Bilingualism (ISB), University of Limerick, Ireland,11-15 June 2017. Ward, Rebecca & Sanoudaki., E. (2017) Bilingualism in children with autism spectrum disorder in Wales, poster at the International Symposium on Bilingualism (ISB), University of Limerick, Ireland, 11-15 June 2017. Almehmadi, W., Tenbrink, T., Sanoudaki, E. (2017) Pragmatic and Conversational Features in Adolescents with Autism Spectrum Disorder, poster at the 15th International Pragmatics Conference, Belfast, Northern Ireland, 16-21 July 2017. Althobaiti, H., Sanoudaki, E., and Kotzoglou, G. (2016) The bilingual advantage: the case of syntactic awareness in Arabic-English bilingual children. Poster presented at the International Conference on Bilingualism in Education, Bangor University, 10-12 June 2016. Sanoudaki, E., & Bodini, A. (2015) Speech breakdown in a multilingual child. Oral presentation at the International Symposium of Monolingual and Bilingual Speech 2015 (ISMBS 2015), 7-10 September 2015, Chania, Crete, Greece. Sanoudaki, E., & Bodini, A. (2015) Dysfluency in multilingual acquisition. Oral presentation at the Child Language Symposium (CLS), 20-21 July 2015, University of Warwick. Sanoudaki, E., (2013) Investigating formal consonant clusters in Greek child language: evidence from non-word repetition. Oral presentation at the 11th International Conference of Greek Linguistics, 26-29 September 2013, University of the Aegean, Rhodes, Greece. Sanoudaki, E., Tamburelli, M., Jones, G., & Sowinska, M. (2012) Consonant cluster puzzles: evidence from Polish-English bilingual acquisition. Oral presentation at the 20th Manchester Phonology Meeting, 24th - 26th May 2012. Sanoudaki, E. & Varlokosta, S. (2011) The acquisition of Binding by Greek-speaking children with Down Syndrome. Poster presented at the GALA 2011 conference, 6-8 September 2011, Thessaloniki, Greece. Sanoudaki, E. & Varlokosta, S. (2011) Binding in Greek: the importance of task selection. Oral presentation at the 10th International Conference of Greek Linguistics, 1-4 September 2011, Democritous University of Thrace, Komotini, Greece. Sanoudaki, E. (2008) The acquisition of consonant clusters by Greek-speaking children. Oral presentation at the Workshop: Consonant Clusters and Structural Complexity, 31 July-2 August 2008, Institute of Phonetics and Speech Processing, Ludwig-Maximilians-Universitat, Munich. Sanoudaki, E. (2008) Word initial extrasyllabicity? Evidence from the acquisition of Greek. Oral presentation at the 16th Manchester Phonology Meeting, 22-24 May 2008, Manchester. Sanoudaki, E. (2007) Word initial clusters in acquisition. Oral presentation at the Child Language Seminar, 18-20 July 2007, The University of Reading, UK.